conversing with God // week two. I am constantly amazed at how much the Holy Spirit is willing to teach me when my heart is open to God’s Word. In case you’re wondering, I do not use any devotional materials (since 2008 anyway). In my daily time with Jesus, I’m accompanied by an NLT Bible, a black Staedtler pen, a yellow Staedler highlight and a trusty ol’ journal. I use a variety of methods to get deeper into the Word: including mechanical breakdown, SOAP (Scripture, Observation, Application, Prayer), word studies and of course unstructured incoherent scribblings. And since these observations are birthed from my journalling, they obviously make more sense to me than you. Firstly, he must faithfully plant (seeds). If he doesn’t scatter them, there is zero chance of plants growing. He must pray that birds don’t prey on his efforts of scattering seeds and eat up those that fell on the footpath. He must (re)position the plants growing on rocky soil to fertile soil, so that their shallow roots will grow deep. He must purge out the thorns and weeds in his farm that prevent the plants from producing fruit. He must prune the plants that are not growing too well, and this painful process usually involves patiently taking one step back (but two steps forward later). He must persist with the plants that fell on fertile soil by cultivating the ground and not getting complacent. Finally, he must press (in) and entrust the growth of the plants to God, and patiently wait for them to produce fruit in season in multiple folds, and then be ready to harvest them. Thankfully, these roles actually have many limitations. It teaches me to be rested in the Lord who grows people and not get restless in wanting to grow them by my (enthusiastic but unnecessary) over-exertions. When I am rooted and rested, my life will be radical (back to basics). “Secret” is a neutral word. I’m inclined to link it our sense of security. And those with nasty secrets live in fear; either it haunts them from time to time, or the fear of it coming to light makes them live defensively. “Exposure” too, is a neutral word. And those who live righteously have nothing to fear. On the contrary, the good things executed and the bad things endured in secret receive commendation and vindication respectively. That’s why the ideal but toughest part of your life to surrender God and let Him dwell in is your heart. No one but the Holy Spirit knows what’s truly meditating in the deep recesses of your heart; after all, who can hide from God? The call to live out the kingdom of God isn’t just an outward show for men but an inward submission to the Master. If you allow the Word of God to purge you and the Holy Spirit to purify you, “secrets” and “exposure” might just become your allies. Lord, grow the Word planted in me in secret and at the right time by Your loving grace, have the Holy Spirit expose to me my known and unknown sins so that I may become more like Jesus. In my secret time alone with You, reveal to me Your kingdom and help me to pay close attention to what You are saying so that I will understand You and receive even more from You. Of course Jesus knew what He was doing when He sailed out to sea with his disciples after dusk. Of course He was “sleeping” in the middle of a fierce storm. Of course He knew that His disciples were oh-so-full-of-faith after teaching about faith the entire day. In the midst of a storm in your life, is your first response to Jesus about how bad your situation is and why He would let you to go through it? In life’s struggles, let’s learn to have faith in Him who doesn’t just control the situations but personally leads us in and out of them. And let’s remember that He is more concerned about us knowing “Who is this man?” than simply delivering us from shipwrecks. Don’t put your faith in the practice of faith, but in the person of Jesus. To “Legion” who possessed the man, Jesus represented the end, but to the suffering man, Jesus represented the beginning. Jairus and the bleeding woman shows us that knowing Jesus requires both faith and fear. Both Jairus and the woman fell at the feet of Jesus; one overcame his reputation, the other overcame her reservations. Would you overcome these to know Jesus? The woman foreshadowed the positive kind of faith that Jairus should have – drawing us towards Jesus. But the people at Gerasenes who chased Jesus away featured a negative kind of fear that drives us away from Jesus – what a contrast! To Jesus, having faith is everything. Maybe that’s why He chased away those who laughed at Him when He said Jairus’ daughter was asleep – not because He was embarrassed, but that He didn’t want these mockers to douse the faith of Jairus, his wife and His three disciples. Our response to Jesus determines our knowledge of Him. Indeed, without faith, it is impossible to please God. You can choose to be amazed by Jesus, or you can choose to amaze Him. If you want to amaze Him, start by scoffing Him, then by taking deep offence with Him. It’ll naturally lead you to a refusal to believe who He is and what He can do. Holy Spirit, please guard my heart and mind against unbelief. Lord, make my heart how it used to be. In taking care of young people, enable me to love as a father could, intercede as a mother would and help as a brother should. 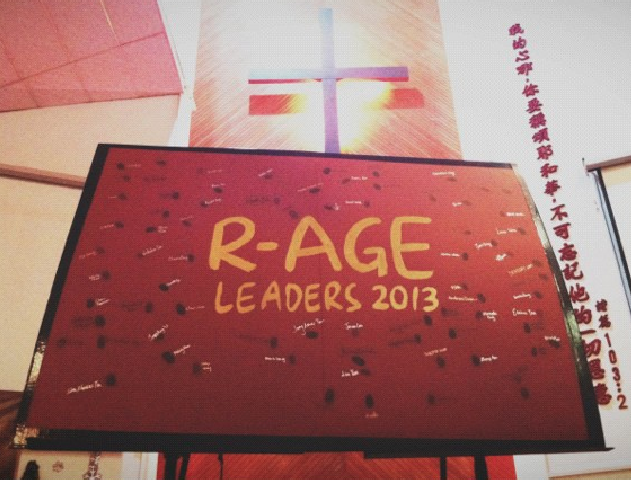 For I desire to lead Your people to shout for joy and sing Your praise. May my hope in You alone anchor my soul in tumultuous days of disappointment. Do I depend on the power of the Master or the proficiency of man when I preach God’s Word, pursue God’s ways and perform God’s will? It baffles me constantly that Jesus would choose to use human agency to showcase the Kingdom of God; that the power of Christ is made manifest through the potential of Christians. Technically, Jesus wasn’t the one who fed the 5,000. His disciples were the ones who brought that miracle to pass. Jesus could have asked the Father to rain manna from heaven to feed the masses, but He chose to involve His disciples in this logistically astonishing mission. What a blessing it is for us to be used by God to bring Him glory! 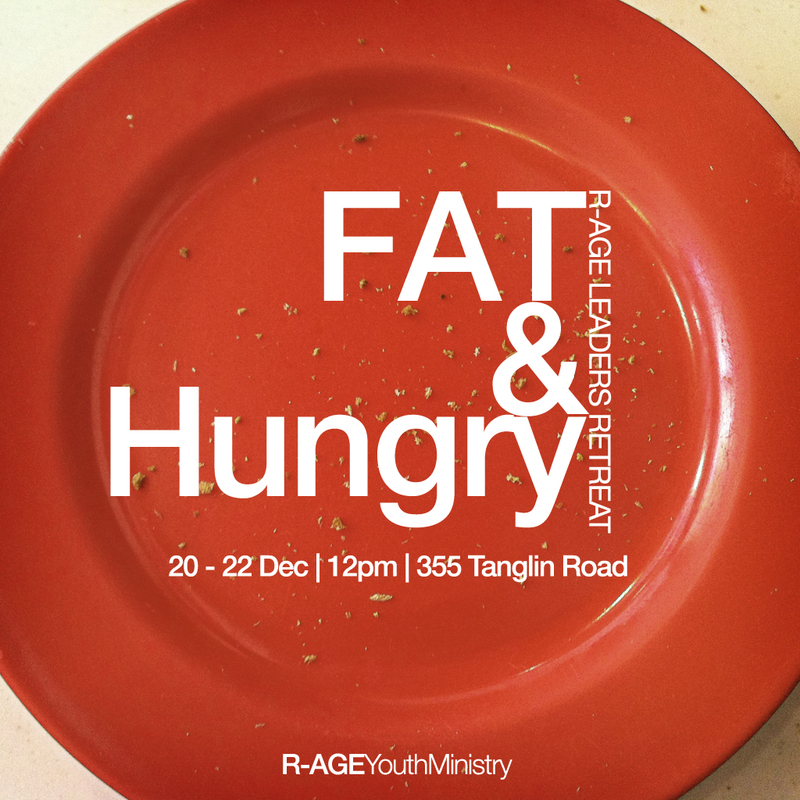 to establish a FAT and Hungry culture (part IV) – hungry. The final session with my leaders was the shortest one. There was no way they could have tanked (I’m learning youth lingo…) another trademark long sermon from me after being turned out at 4am to clean the entire church. I trust that the structured experience would be etched into their hearts for a long time. And if I can find the piece of paper that I scribbled down my debrief pointers (“Leadership lessons to be learnt”), I’d post in another entry. At around 6:30am, we dismissed everyone. Most of them returned to their bunks and a handful became all-terrain sleepers; the GI Chapel morphed into a huge dormitory. At 10:30am, we assembled them in service for the last time, and I began my sharing by stating that we ought to be hungry for two things: God’s whereabouts (His presence) and God’s will (His plans and purposes). However, what prevents us from getting hungry is when we are already being filled and have no more space in our lives. 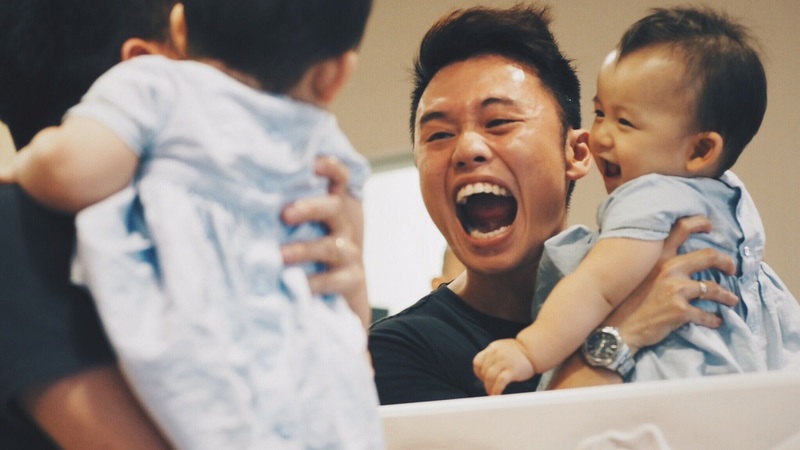 I thought Kenneth Yeo brought out this lesson superbly at Minus One (an initiation of sorts involving the new leaders just before Leaders’ Retreat commenced). He split the leaders into a few groups, lined them up and got them to transfer water from a bottle at the start of the line into a bag at the end of the line by passing it from one person to another other via sponges. Then he introduced a twist by pouring a little Ribena syrup into each sponge, and challenged them to do the same thing without any trace of Ribena in the bag. The leaders instinctively used half the sponge to execute this task and ended up transferring less than half the original amount. If you have too much of worldly things cluttering up our lives, how are you able to stay hungry for the things of God? Your appetite is directly proportionate to how full you are. Try eating an expensive dinner immediately after a cheap lunch – the thought of food would repulse you! If you want to be hungry for God, then you have to learn to de-clutter and de-accumulate. The scary but ironic thing is when ministry and church work clogs up your life and takes away your hunger – that would be a travesty. In John 4:34, “Jesus said to them (his disciples), ‘My food is to do the will of him who sent me and to accomplish his work. '” I believe Jesus revealed to us the secret to being filled with the things of God. But to do the Father’s will, we must first know His will. Only then are we able to accomplish the Father’s work. That is why the Grace AG theme for 2013 resonates with my soul; paraphrasing what my senior pastor (Ps Calvin Lee) said, in order for us to effectively live life missionally, we must first be deeper in the Word. Ezra understood that well. In Ezra 7:10, we learn that “Ezra had determined to study and obey the Law of the LORD and to teach those decrees and regulations to the people of Israel.” Through this, I derived a four-step approach to God’s Word that I will share over the pulpit in greater detail in the last week of January. Grasping this, I believe with all my heart, has the potential to change the way we live as well as to change the world that we live in. If we are not changing the culture, we’re not changing anything. But if we, like Ezra, are determined to SORT out our approach to God’s Word, I’m sure we will constantly remain hungry for God’s presence and His will. Study: read, remember and reflect upon His Word. Obey: apply what we have learnt. Reap: the benefits of applying God’s Word. Teach: pass on these benefits to others. Personal revival: experience revival everyday by getting deeper into God’s Word. Divine appointments: sense the Holy Spirit leading you into a divine appointment. Active obedience: learn to obey what the Spirit put upon your heart to do or say. I believe that once you catch this method of evangelising, of loving people in the name of Jesus, you will never look at preaching the Gospel in the same way ever again. My desire for my (spiritual) household and I is to practise the PDA lifestyle and to leave the results to God. Sometimes, it doesn’t necessarily have to culminate in a dramatic conversion. Sometimes, all that’s needed at the moment is a simple spiritual conversation. All you need is to faithfully do your part, and learn to trust God for the outcome. If you want to live from the inside-out, then your perspective must change; God didn’t call us to be a student, a teacher, a pastor, but to be a witness! Live your life in the Word and let the Gospel be seen in your life. We have to preach the Gospel at all times, and if necessary, use words. If anything at all, I think the X-factor of a believer is authenticity, and not perfection. I’d rather be real and flawed and to appear perfect. After all, if Jesus can love me even though I’m like that, then Jesus must really love me – that’s what the pre-believers should see in your life! In summary, a hungry Christian is a growing Christian, and his appetite for learning and doing God’s will should never diminish regardless of his age or education level. If you call yourself a hungry and growing Christian, then I’d expect you to always seek the better way; choose the way of wisdom and apply it into your situations. The moment you stop learning is the moment you stop growing. It is my prayer that I’d always display an appetite for growth and an active pursuit for opportunities to mature in Christ. conversing with God // week one. If I can keep this up, I’ll try to consolidate my daily devotional reflections at the end of every week. In preaching the Gospel and doing God’s will, Jesus must be to me three things: the motivation, the means and the message. For without which, I’d have no purpose, no power and no point. Continuous conversations with and a downright dependence on God remind us that salvation is for those who know they are sinners, not those who think they are righteous. Separate the serious from the curious. Invite those you want to go with you. Wait for willing ones to respond and come to you. Appoint them formally and call them your disciples. Allow them to follow and accompany you in ministry. Enable, empower and send them out to preach the Gospel. (Show them where your authority comes from and) provide opportunities for them to exercise their spiritual authority by faith to help others and set them free. Strangely and stupidly enough, some of us desire to be accelerated to #7 before we accomplish #1 to #3. For me, #3 is the most important step in discipleship because that’s the trigger point where a congregational believer grows into a committed one by being willing to die to himself and take up the Cross – the marks of a true disciple. #3 is also the only step where discipleship is not determined by the intentionality of the discipler but the initiative of the disciple. Let us not be too hasty to do God’s work before we even surrender ourselves to His will and way. God-fearing Christians should EXPECT suffering, for God’s purpose in it is to help us IDENTIFY with Christ, and to enjoy the VICTORY that He has already won. Doing GOOD in the face of suffering, especially responding in LOVE to both friends and foes, creates a powerful OPPORTUNITY to share our faith. When we undergo fiery trials knowing that God is both SOVEREIGN and FAITHFUL, we will be RESTED not restless, for He is in CONTROL! God, I entrust my soul to You!!! On top of expecting suffering as a Christian, I want to EMBRACE suffering for it identifies me with Christ (since He suffered in the physical). But more than that, it allows me to experience the victory over the power of sin that He won on the cross. That is why my internal attitude towards suffering trumps my external ability to withstand it; an attitude of love displays my relationship with Christ, covers my own sin and causes my sins to be forgiven. Lord, help me to embrace suffering with an attitude of love! The Master has entrusted each of you with at least one spiritual gift (out of a minimum of 19 varieties) to use and manage well for two purposes: 1) serve each other and 2) bring glory to God. So the question isn’t whether you have a spiritual gift or not (because you do), but whether you are using it for its intended purposes, or to serve and bring glory to yourself. Serving with your God-given gift is a privilege; it isn’t something you have to do, but something you get to do.